Another entry in the sporadic web series, Barry & The Setbacks. Enjoy (or don’t)! Posted in Barry and the Setbacks. Haven’t seen this video before. One of the rockingest songs on their album Time For A Witness. Not sure if I have seen this video, either. You can’t not be happy listening to this song. A pretty cover of VU’s “After Hours, played during a soundcheck from their July 4th night at Maxwell’s. Maxwell’s is going to close at the end of this month. It means a lot to a lot of people. I only went there one night, but it was where I got to see my favorite band, and I will miss it. All these videos were uploaded by the wonderful @zippy49. Thank you, Janice. When I was negotiating the sale of my sports card collection, Michael Osacky had indicated as a possible enticement that he would write about my collection for Parade Magazine. My story would be up in lights! Or newspaper! Anyways, he indicated he had some sort of role as a columnist for the magazine. After I published my blog post, I sent him the link. He got back to me a little later and thanked me. Yesterday he sent me a link to his own article. From what I can tell, this was his first article for Parade. I thanked him for the article, but then after a while I started thinking about it. He didn’t link to my original blog post at all. I couldn’t remember what stories I told him, and what stories he might have gotten from the blog post. I thought that the post itself was a nice remembrance of my dad, seen through the prism of my card collection. Should he have linked to my post? Was it relevant? Was what he posted incomplete? It was about things, but not memories, feelings, or people. I’m not really sure what it’s about. I messed this one up a bit. 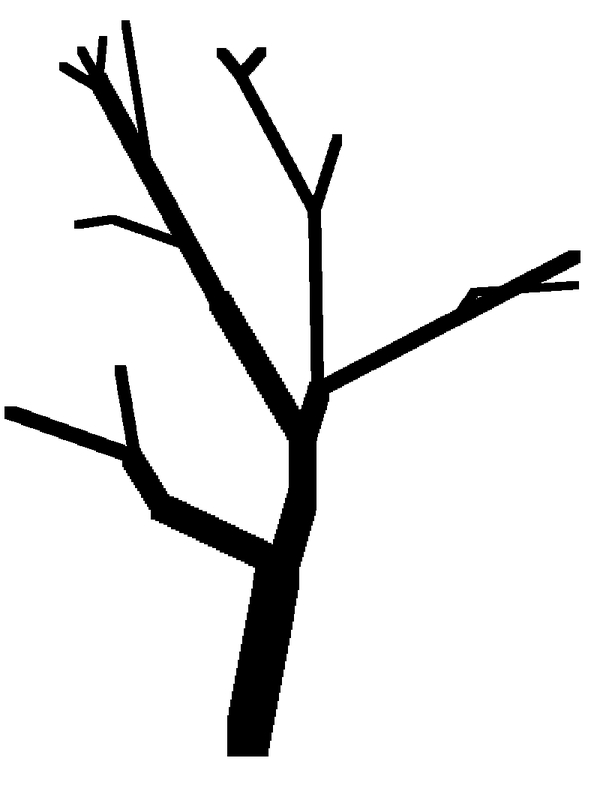 The lower left branch should have extended longer at the end. 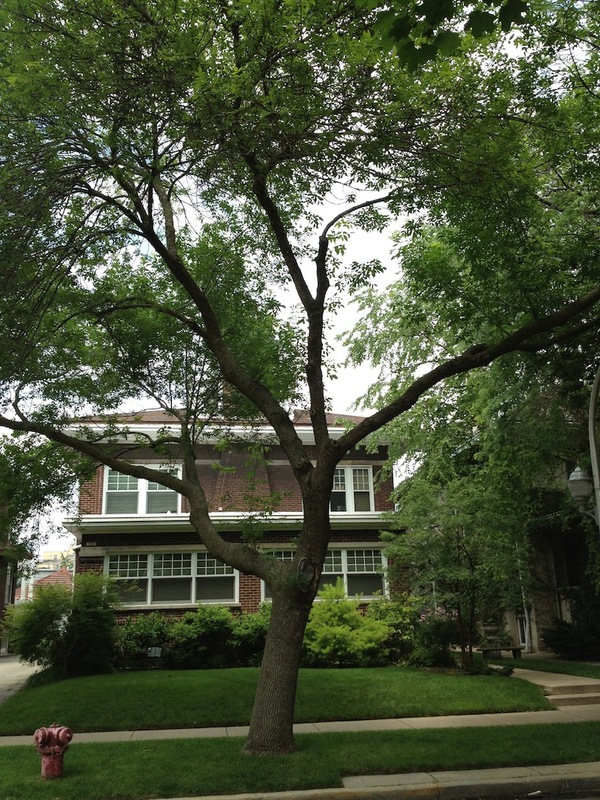 I think I should have had the thicker lower branch a little shorter. Ah well. I took a few Instagram videos on the way home from work. My connection was kind of spotty, so they eventually all failed to upload. It was kind of annoying, because, unlike photos, you can’t select videos from your library. You have to go straight from camera to upload, and if the upload cheeses, you’re hosed. This is the same way Vine works (or doesn’t work, rather). Boooooo! Oh, the other day ShesAllWrite did a nice comparison of Instagram and Vine. I do like the look and feel of the Instagram video, and think 15 seconds is a much nicer time to work with than Vine’s 6 seconds. Since I have been able to make videos on Instagram, I haven’t gone back to Vine once. Anyways, I uploaded all my failed-to-upload videos to YouTube. I think they’re nice. I follow 2 out of the 3 people on Vine that I discuss in this post. The third person is fine, too! I just don’t follow him. Sorry! I don’t claim to have insight into their personalities, beliefs, dispositions, emotions, or anything. But I think something odd has happened. Very odd. 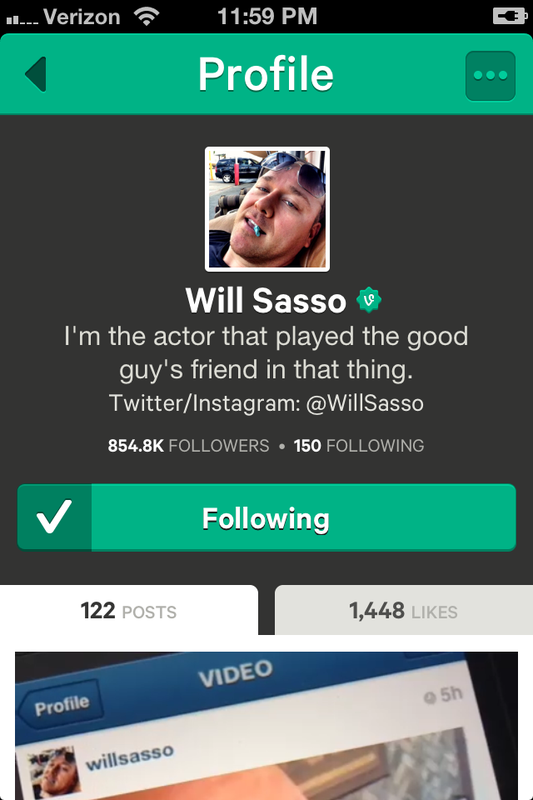 Vine is a Twitter-owned app where people can post 6 second videos from their phones. Instagram is a phone app which was bought by Facebook in April, 2012, and until yesterday, was strictly used for making/manipulating/sharing photos. Now, Instagram hosts videos as well. You can record up to 15 seconds of video, as well as apply one of a series of preset filters. Vine has around 13 million users, while Instagram has around 130 million users. There are lots of people who have made Vine videos (myself included), but some people have risen to the top and gotten a certain degree of popularity/celebrity from their posts. Actors James Urbaniak (Henry Fool, Venture Bros.), Will Sasso (Mad TV), and Adam Goldberg (The Hebrew Hammer, Dazed & Confused) are three such people. What I find interesting is how the announcement of Instagram’s foray into short videos might have an effect on them. I’m not going to predict the future and say Instagram will supplant Vine, but I think it’s certainly going to draw some people away from the platform. Two of my Twitter friends joined Instagram today, with one admitting that it was due to the introduction of Instagram video (Hi, Rob!). James, Adam, and Will have accounts on Vine and Instagram. However, their Vine accounts are screamingly more popular than their Instagram accounts. 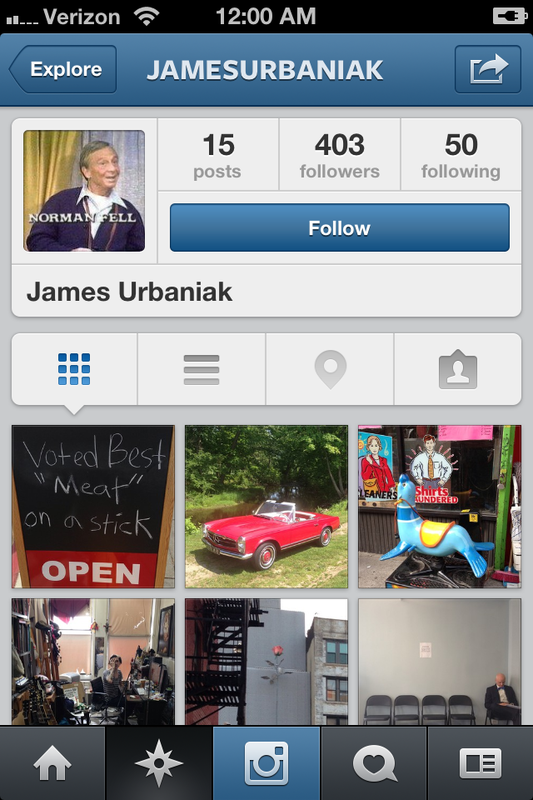 Urbaniak Vine (22,225) / Urbaniak Instagram (403) = 55.15, which means Urbaniak is 55 times more popular on Vine than he is on Instagram. Again, I have no idea in hell what is going through their minds at this point. Did these guys have any clue that they would have found some degree of notoriety on Vine in the first place? Do they see a cool thing vaporizing with the possible dwindling popularity of Vine? Do they feel threatened? I HAVE NO IDEA. But it’s an interesting, weird thing to think about. All three of them *have* addressed the advent of video on Instagram. Here’s their take on it. 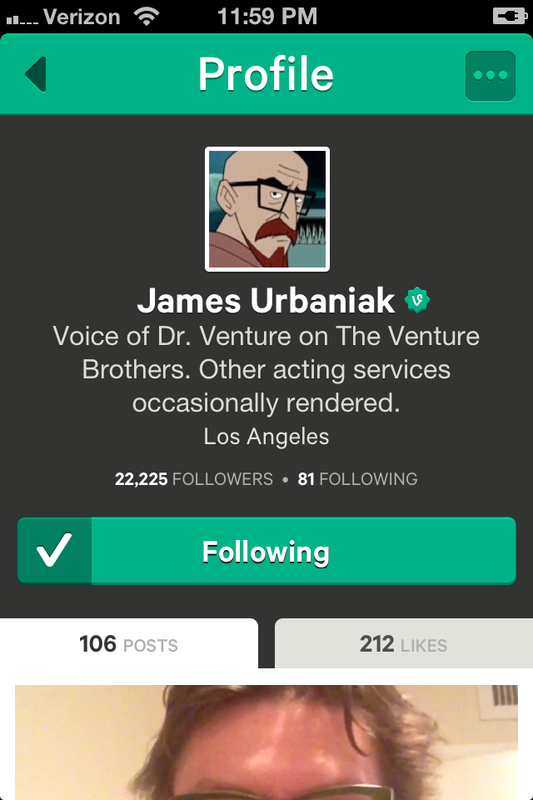 On Vine, James Urbaniak flips the bird to Instagram. As of this post’s writing he has yet to post a video to Instagram (his last post there was from last week, and he has only posted 15 photos in total). 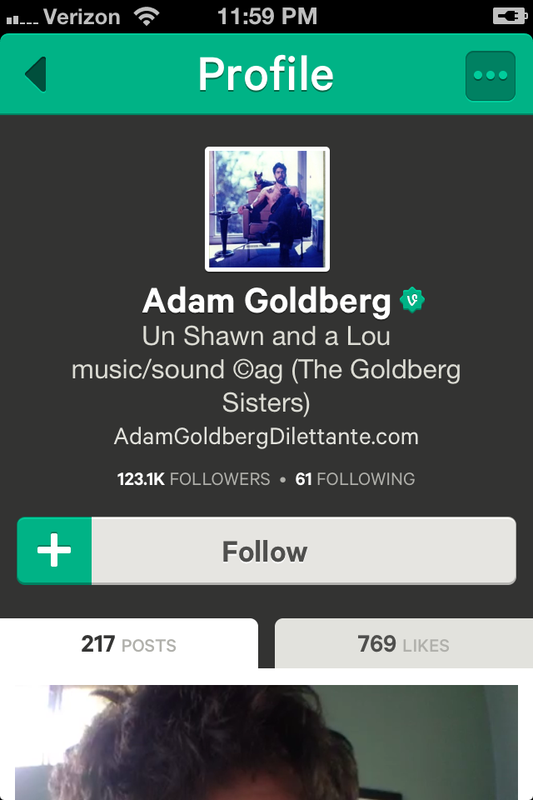 NOTE: Vine videos are muted by default. If you want to hear a video, hover over it, then click the speaker with the red X to unmute. 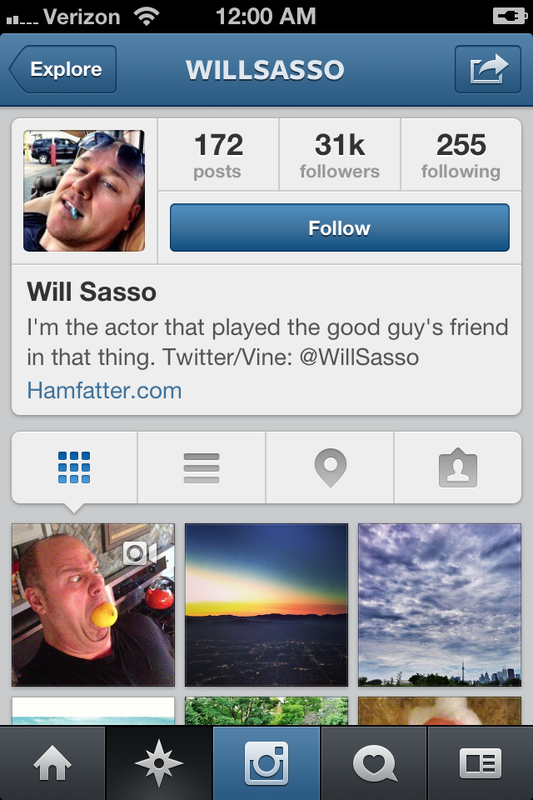 Will Sasso seems to find the extra time a little too liberating. He takes a classic Sasso Vine trope (“Lemons!”) and stretches it out to the full Instagram running time. He made a Vine of the first few seconds of the above video, too. 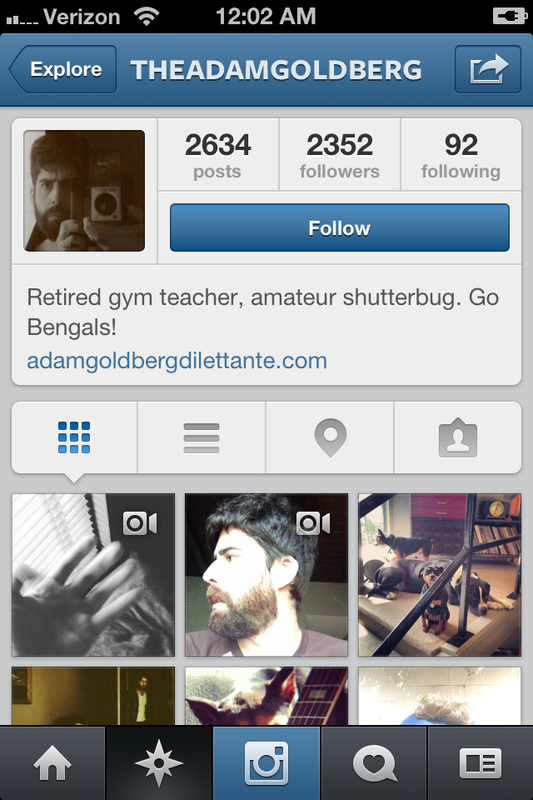 Yesterday on Vine, Adam Goldberg spoofed the release of Instagram. The next day, on Instagram, he denies he is in the pocket of “Big Vine”. He plays around with the format in Instagram, and (jokingly) finds he has too much time on his hands. This morning, I was part of the huge crowd of suburban commuters streaming out of the east Madison Avenue exit of Union Station. It’s a little chaotic when you step outside the station during morning rush hour. There’s not a ton of room. Often, there are several representatives from a random company strategically placed in your way, handing out free samples of something-or-other. Lately, there have been a couple people standing next to their own little book display near the outside entrance who want to tell you something about The Bible. Some commuters want to cross Madison Avenue, some commuters want to walk east on Madison, some commuters want to walk west. I walked by a couple women, one of whom was waving to yet another woman, who waved back. The couple and the single woman were separated by a throng of people, but the single woman was making her way towards toward them. Back to the couple of women. The non-waving woman (NW) said to her waving (W) companion, “Do you want me to wait for you?” It seemed like W knew the other woman, while NW probably didn’t, or at least didn’t know her as well as W did. W replied, “Okay, you can do it.” This reply was uttered in a nice-but-lazy tone of voice. The interaction between NW and W stuck in my head on my walk from the train to my building. I didn’t like what W said. Why did she say that? Why couldn’t she have simply said, “Yes, please.”? NW had offered to wait. She said something nice and selfless. W basically gave her approval to NW’s action, but without acknowledging the gesture/niceness/sacrifice NW offered to make for her. What was the nature of W and NW’s relationship? Was it unequal? Did NW often offer help or comfort to W, only to never have it acknowledged by W? Did W do this to everyone, or just NW? Or, less likely, was NW usually the oblivious jerk of the relationship, never recognizing the friendship of W, and W was just being passive-aggressive about it this one time? I don’t think I’ll ever know for sure. I didn’t realize it, but my soul really needed a bike ride through the woods today. Thanks, Salt Creek. Note: While I was making the above animated GIFs and writing this post, I was listening to, God help me, Carly Rae Jepsen’s “Call Me Maybe”.